Let the peony digging begin! With the lovely rains this week, we had to postpone the start of our last peony dig. For those of you who have been waiting for our final shipment, we will post the progression over the next week or so. Digging crew was able to pop a few out of the ground before the rains came but only a few hundred more to dig. Thanks again for your peony orders and we will make sure to take wonderful care of them before you receive. Last day to order for 2015 is Friday, September 18th! Hard to believe, again, that the 2015 peony season is coming to an end here at Swenson Gardens. Seems like last week we were anxiously awaiting the first sign of life under the barren brown landscape. Yes there is lots to do yet and for those of you gardeners who are putting off ordering your peonies for 2015, the last day to order is this Friday, September 18th! Thanks to all of you who have already ordered and will post updates on shipping your peonies in the next couple of weeks. FInal Peony Barn Sale September 12th! We need to sell our remaining leftover and 1-3 eye wholesale peony roots! I just love sneaking on the Blog now that I know the secret password! Sorry dear but I will soon be posting a ‘secret’ password on Facebook that allows those visiting the Peony Barn Sale and picking up roots an additional 20% off the already reduced pricing. Don’t tell Keith yet but the secret code is ‘REDD’. Since Redd is the master of mischievousness around our farm, its only befitting that I continue his MO. Mention ‘Redd’ at the Peony Barn Sale checkout and receive an additional 20% off your barn sale roots. First come first served and limited to the leftover and 1-3 eye wholesale peony roots at the final day of Swenson Gardens peony barn sale. Happy shopping…and saving! Final Peony Pickup Day Saturday, September 12th! For those of you who didn’t make it out to pick up your peony orders last Saturday, this Saturday, September 12th from 9 am to 5 PM is the final day. Please make all attempts to pick up your order on 9/12! The address again is 10958 70th ST SW, Howard Lake, MN. Thanks! Good morning Swenson Gardens bloggers! Becky here and thought I would spend some time with you. If you haven’t been following our Facebook page, here is a taste of what I’ve been posting as of late. We’ve received numerous inquires on how to plant bare root peonies. The first step is to identify which way does the root go into the hole? Yes from time to time gardeners have planted their roots upside down thinking the stems come out of the roots. No, the stems come from the eyes. 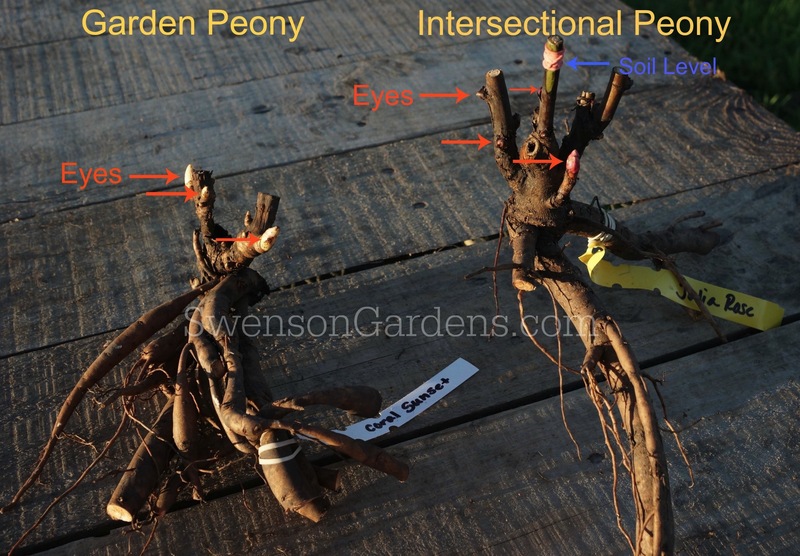 You will notice in my picture the two different types of bare root peonies that we sell. One being a garden peony (from our website those are noted in our Garden Varieties, Distinctive Peonies and Collector’s Peonies pages) and two, the ever popular Intersectional Peonies. The recent orders pertain to USDA Growing Zones 2 – 5, so this post is for you. The eyes should be 1 1/2″ to 2″ BELOW ground level on all garden peonies! You will not see the eyes/crown/last years stems on the garden peonies as they will be under ground level. Make sure in your excavated hole that the roots are placed on a tamped down base in direct relationship to their ground level position i.e. 1 1/2″ to 2″ below ground level. 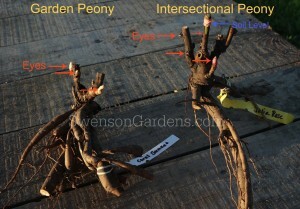 Intersectional peonies are much easier to plant as the red rubber band is your ground level. Just make sure the ROOTS are at the bottom of your hole and the red rubber band is at ground level. More posts forthcoming on moving peonies, digging peonies and dividing peonies. Please be patient as we have been very busy trying to get our first shipment of peonies out! Happy planting bare root peonies! First shipment of peonies on there way! Most of you will be receiving shipment notifications from USPS Priority Mail on your peony orders. Just a few special instructed orders to ship but the majority were delivered this morning to our local post office. THEY, meaning USPS Priority Mail, say 2-3 day delivery, but we have had excellent success with Priority Mail on averaging 2-3 day delivery. Some will receive tomorrow and others in a few days. For those of you with PO Box addresses, look for your notice and pick up (and plant) as soon as possible. Happy planting peonies! Ok gardening friends, your peonies are ready to pick up on Saturday, September 5th and 12th from 9 am to 5 PM rain or shine. We will have a canopy set up at the entrance to our processing barn. We can’t wait to see you again! Regarding parking, come all the way north on our driveway past our home and you will be greeted at the information area close to the canopy on where to park. Please do not park anywhere on our driveway or lawn as we will have you park in our sand riding area. If anyone needs special assistance, please let us know at the information area and we will accommodate special parking privileges and any help that you may require. Some of you have been emailing and calling on how soon do you need to plant your new bare root peonies? Our normal response is sooner the better! How soon is soon? We would say within a day or two. Just make sure NOT to leave them in a hot vehicle or any place in direct sunlight. They are packed in sphagnum moss and try to keep in a cool, dark place until you can plant them. It would also be wise to check on them and mist some water on them if they are held in storage before planting. Do not put them in a refrigerator as that is too cold for them now. They need about 6-weeks in the ground in order to develop tiny feeder roots before the ground freezes. So use your best judgement on when to plant them and if not able to in a few days, again, store in a cool, dark place, leave the bag open so condensation does not build up inside the bag and mist lightly if keeping them in storage if longer than a few days. Remember to pick up a bag of our chemical free peony starter fertilizer of which one bag per root is all you need for decades to come. If any questions on how to plant your bare root peonies, experts on hand to help you with that. Now our road before you head north on our driveway is rather bumpy and rocky as they are trying to rebuild it after the mess we had last spring. Finally per our insurance policy I have to share our disclaimer that they require anytime the general public is on our property so bear with me, upon entering our property at 10958 70 th Street SW, Howard Lake, MN 55349, Swenson Gardens, Keith and Becky Swenson, its employees and agents shall not be held liable for any injuries and/or death when visiting our property. You are on our property at your own risk. We ask that you be careful as this is a working farm including equipment, livestock, electric fences and a pond. Please keep any children under direct adult supervision at all times. It is ok to look at the animals but be aware that all our fences are electric. We want all of you to have a safe and enjoyable time will you visit our property! Thank you and thank you for letting us grow these amazing peonies for you! Have a safe trip out here and be sure to check out some apple orchards like Fall Harvest in Delano, Carlsons Orchard in Winsted and stop in at Cattail Corners in Howard Lake for some fall color and natural pet supplies. See you tomorrow or on Saturday, September 12th during peony pickup days. The leftover and wholesale peonies are ready for their new home! All pick up and ship orders are done so please help us reduce the amount of peonies we have to plant back this fall by taking a few extra home with you! For those of you who are new to our peony barn sale, it happens on Saturday September 5th and 12th from 9 am to 5 PM rain or shine. Our processing barn is set up in a retail and wholesale area. For those of you who ordered retail roots from us and are picking up, you and any friends/family that you bring along will also receive 10% off for any additional roots that may find there way into your heart and pocketbook. Cash and check only! No credit cards during this sale. Our address again is 10958 70th St SW, Howard Lake, MN. 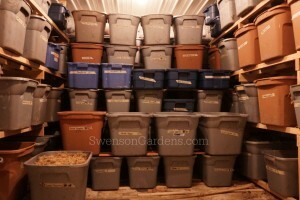 See you tomorrow or on the 12th at the Swenson Gardens Peony Barn Sale! 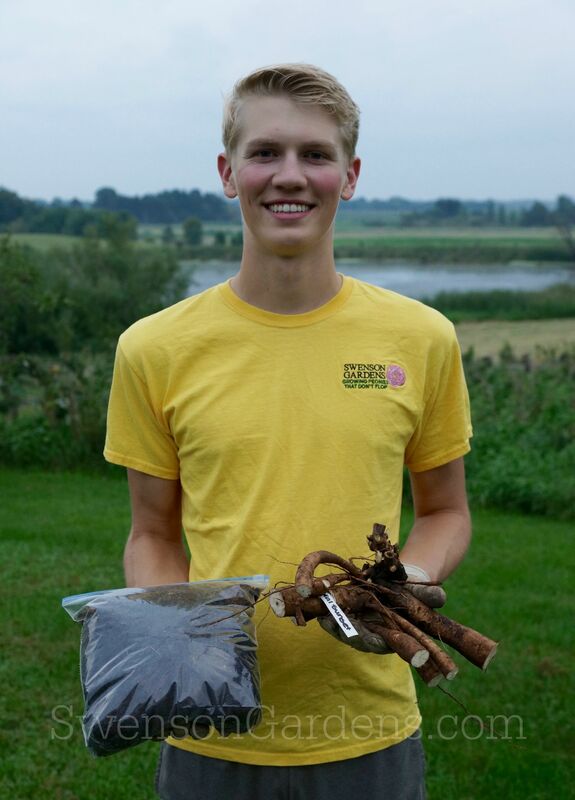 The peony compost team and our son have all been busy preparing our chemical free peony starter fertilizer that will be for sale when you pick up your orders or when visiting our peony barn sale. We can’t use the word ‘o_r_g_a_n_i_c’ so thus the chemical free phrase is ok. All ingredients are chemical free including the composted cow manure that we let set over one winter, no grain or corn is fed to our cattle and all our pasture and hay has never been sprayed with chemicals. It always concerns me when buying a bag of composted cow manure when you really don’t know where it has come from and what chemicals, antibiotics and feed is included. The reason why we let our compost winter one season is to make sure any weed seeds are killed by the low winter temps and the high summer temps as it is decomposing. The bag he is selling contains enough nutrients for years to come. He sells it for $3.00 a bag and each bag is enough for one root. He would be glad to talk with you about the ingredients he uses except for the ‘secret’ ingredient that have have literally GROWN to love in some of our test fields. Oh by the way, this will also help his college fund. Not sure why this is his favorite time on our peony farm? What does a cooler half full of peony roots look like? Becky took a wonderful pic before this cooler was absolutely full. Some of you have asked why do we store the processed roots in a cooler? Well here you go, the thoughts for us anyways, is the fact that we can maintain a constant temperature and humidity level vs storing them elsewhere. The key though is not to store at too cold of a temp whereby they think its time for winter. Thus a constant temp of 55 to 56 degrees affords them less stress especially when it has been in the mid 80’s all this week. Humidity is important as well as you don’t want the humidity too low where by the moisture is removed from the roots or too high which may lend itself to surface mold so we settled on 70% for now. All the tricks of a peony grower to make sure the roots are out of our ground, stored properly and then they can find a new home in your gardens! If you haven’t been liking or following us on Facebook, Becky has a whole series on what our process is at Swenson Gardens. A MAJOR milestone today as the picking and packing crew completed the majority of the orders with only 38 more to go tomorrow. Congratulations team on setting a new one day picking and packing record of 315 orders. They did a great job and when finished the packed roots went into another cooler and the remaining roots went into this cooler. Lots of love expended on our peonies whether in the ground or out! If only the peonies knew how much work it takes grow and sell them!